Farewell to Myrtle Beach! | NJNA is Blogging! Today was the last day of seminar stitching! I made some progress on Starfire, but I also did a lot of backward stitching as well! Some people in our class are almost finished stitching this, but I had two conference calls and all that ripping out to slow down my progress! My threads for Starfire were more pastel than others in the class — this gives the piece a very different look and feel. 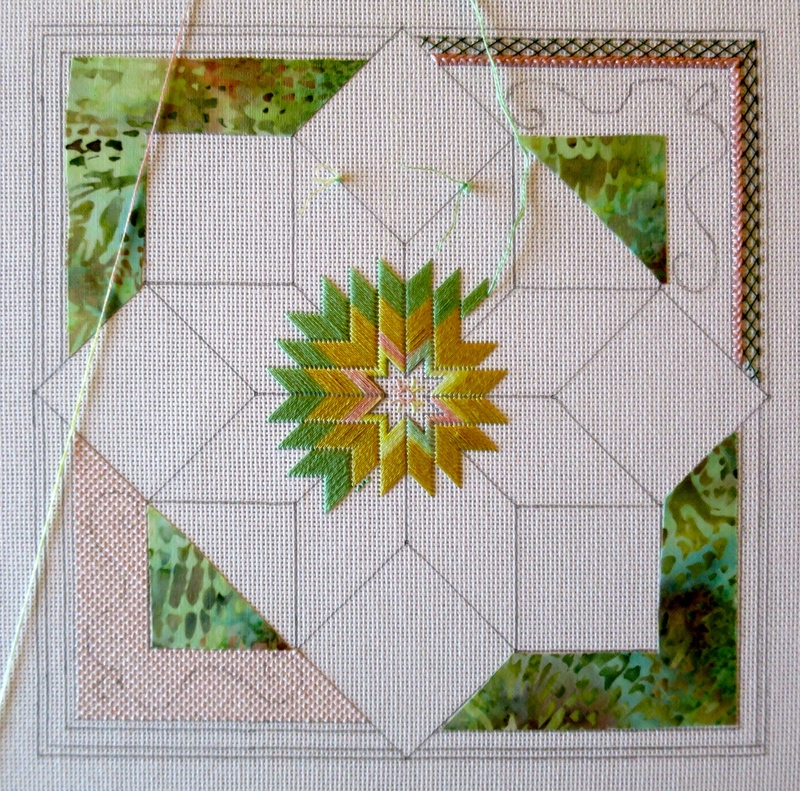 I may restitch a few areas with a darker thread so that the blackwork areas can be better seen against the white canvas! We have been getting a lot of rain — so much so that this morning both the hotel wireless system and Verizon went out for a while — apparently two cell towers were flooded! I’m back on line now and that is such a relief! Sue and I have been packing our bags and we hope to get most of the car packed tonight after banquet so that we can get an early start in the AM. We hope to get as far as Winchester, VA tomorrow! It’s been a fun and exhausting week filled with good friends, good food, beautiful projects, and fond memories! Thanks for letting us share our experiences with you! Rosie and all the NJNA ladies that entertained me all week. Loved reading of each day’s adventures and watching your work progress. Please keep posting pictures as you finish your fabulous class projects. Do drive home safely – I’m hearing there is bad flooding in Myrtle Beach. I love the corners. I want to see them up close!